With all the focus on direct messaging for business - with Facebook, in particular, looking to improve their customer experience options through the use of messaging - it's been somewhat surprising to see Twitter sitting it out and not working to highlight their direct connection capacity, as various studies have shown that Twitter is the preferred platform for customer queries. 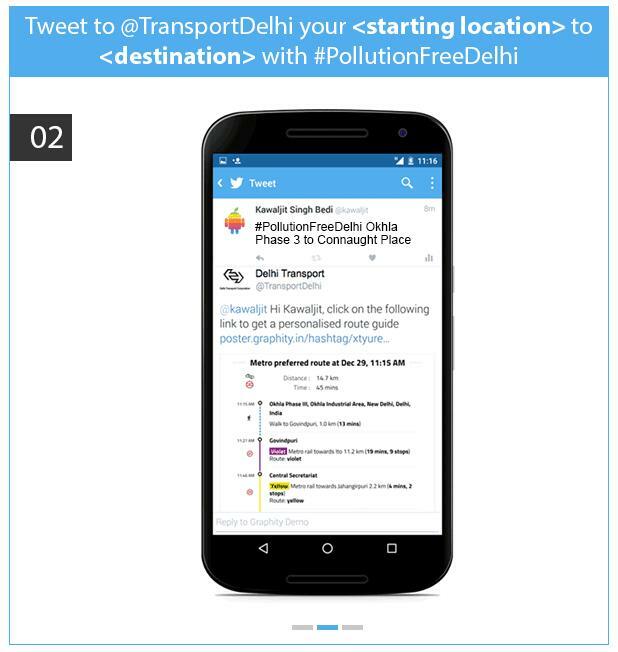 The more public nature of tweets plays a big role in this - people know that brands are more likely to respond to a tweet as everyone can see it - but the short messaging, real-time focus of the platform also makes it more ideally suited to this type of query. You have a problem, send the company a tweet or DM, they get back to you quickly. It's a simple, effective and non-intrusive way to cater to this need. So given Twitter's various problems of late, why aren't they looking to highlight this as a means to drive more usage and engagement? Well today, Twitter have taken their first steps towards tapping into the wider messaging trend, and the use of automated responses, with new features being added to Twitter's direct messaging tools to better automate and streamline the customer query process. As you can see, Twitter's adding new automated elements into the brand messaging process, making it easier for users to get faster responses, and easier for brands to action them without putting additional pressure on their existing resources. 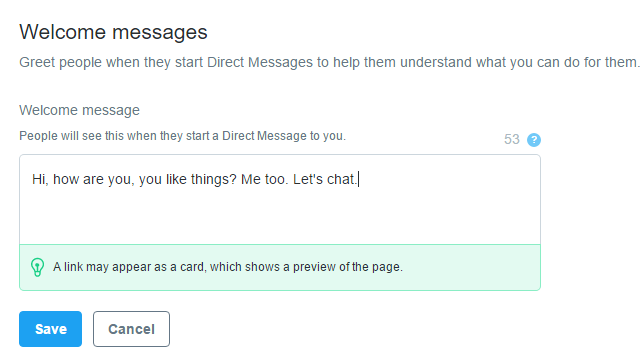 First off, there's welcome messages, which enable brands to greet customers as they enter a Direct Message conversation. Now, when a customer chooses to DM a business, that brand can provide them with a simple greeting to kick-start the interactive process, along with a range of quick replies that the user can select. "Businesses can create multiple welcome messages and deep link directly to a specific greeting from Tweets, websites, or apps. Welcome messages help businesses demonstrate their commitment to service and help people learn what options exist to engage with a business in Direct Messages." To set up your welcome message, you need to have customer support options switched on for your profile, which you can do within Twitter Dashboard. 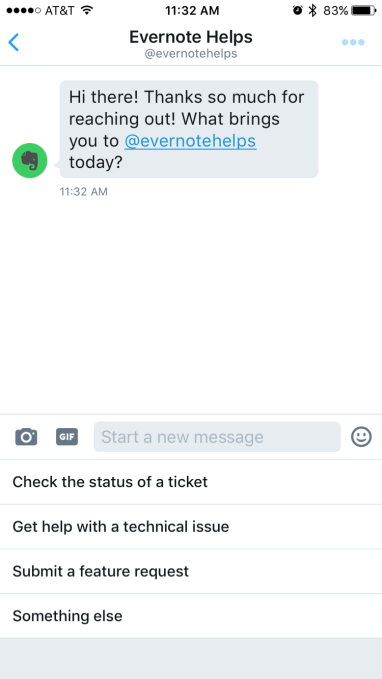 Once your profile is listed as providing support, you can enter your message that will show up whenever someone initiates a DM conversation with your business. UPDATE: Twitter shut down their Dashboard app in January 2017, but you can still access these tools vis the Business Features page here. The second element - quick replies - is a little more technical. The idea behind quick replies is that is expedites the communication process - if there's a common query that people ask (like, in the video example above, "What's the status of my order? "), you can build an automated system that can handle those queries without having to involve you or your staff - the process in this instance is designed to get the users' tracking number then provide a response based on system reference. "If you're interested in creating automated experiences in Direct Messages for your business, contact those companies directly for more information. We're working with a wider group of partners who will offer solutions to their customers soon as well." It's a logical progression for Twitter, one which, as noted, it seems like they should probably have been focused on for some time, particularly given the platform's place as a key connection tool for customer support. In fact, Twitter really should be talking up their customer support functionality more widely - there are several of ways in which automation like this is actually already being used within Twitter for public service, including in India, where people can get information about public transport options, in real-time, as they go about their journey. That seems like an obvious use of Twitter, an obvious way in which the platform can be used as a utility service, with its live information focus perfectly suited to such updates. Another example is how USGS Texas Water Science Center uses fully autonomous Twitter accounts to track rainfall levels and ensure the relevant communities remain aware of the potential for floods in the region. If Twitter could boost public reliance on the platform for such purposes, including brand interactions facilitated by these new tools, that could get more people more active on the platform - i.e. people sometimes struggle to see the purpose of tweeting or the need for the platform. If Twitter could highlight more of these practical, immediate response tools that are available, that could help highlight why the platform is an essential app, and why more people might want to use it. Aside from working to appeal to younger users with cooler new functions and features, Twitter's also in a position to become a key connection platform in this vein. Facebook's trying to muscle in on this territory with their Messenger for business options, but really, that seems like they're trying to catch up to Twitter, a movement that could eventually reduce Twitter's overall standing and utility. 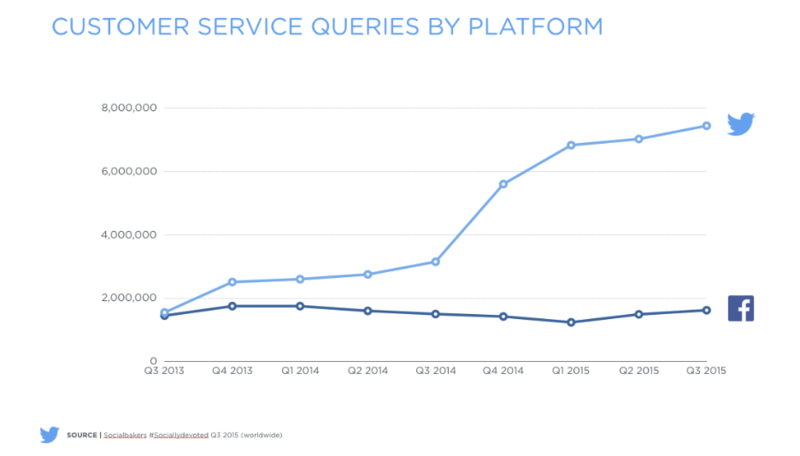 But they are trying to catch up - as highlighted by the above stats, Twitter's already seen as a key platform for customer queries. Why not capitalize on that advantage? With these new features, and more automation tools on the way, Twitter's taking steps in this direction. Hopefully it helps highlight the platform's strengths and further refines their product focus.